U.S. Marine completing my last tour on active duty and working as a diesel mechanic part time servicing medium/heavy duty trucks. I also have my CDL Class B license. All in all the test is intense and proper preparation is a must! Do you ever watch up feeling dizzy, disoriented, or have a massive head ache? If you do, you know the cause? Have you been tested for sleep apnea? Some of these symptoms might be caused by lack of oxygen? guy laid into me and let me know that any time he needed some advice from a "super trucker" he would ask for it! I hear that! My truck driving itch started about 10 years ago. I see from your profile that you're a diesel mechanic. I've thought about pursuing that career path. If you wouldn't mind, I would be curious you hear your thoughts about the job? You can PM me if you don't want to discuss in the open. I was wanting to let the company pay for school just to ensure I can keep supporting my family while training...I do have the money to pay for school but it would be tight if things didn't work out so company sponsored is how I am going. Understood. Sounds like a good plan. What he said. I'm home every weekend so it's not as bad except for my volunteered runs that are usually 6-8 weeks. We talk at least once a day/night and try to video chat each evening. 12 yr old daughter that I call every night to tell her good night. Don't try to be a dictator from the road, your wife is there everyday and needs your support in decisions she makes at home. When you do get home make sure that you & your family get some quality time together. You can't come in and start complaining about what she has or hasn't done & don't just come in and veg out for your time off. No company I've contacted, or applied with are hiring rookies in my area to do what I want. Building relationships and gaining first hand knowledge at the event would be a good thing. However, it could be frustrating if you find something you really want but aren't qualified for it. You might want to think about committing to OTR for your first year in order to open up a ton of options. This course of action is highly recommended by "Old School" and he discusses this topic on several posts. Hope this helps. If you are interested in flatbed, companies like Maverick and TMC offer regional routes for new drivers. This would get you home most weekends. Check out Dale Clay's YouTube videos for some good information on Maverick. After over 3 years of OTR, I finally landed a cushy local job driving double tankers. Home daily, 2-3 days off per week with hourly pay. If you work hard, the sky is the limit! Congratulations on your new job. You are a great example of hard work and perseverance. I can't stress enough how hard this next year will be. Brett's book includes a section on the stress and strain of OTR life on a a family. Hope this helps. Except they are not a driving company simply a school. Even though they boast that they will provide job placement (they have various Trucking company recruiters come in ). If you are interested in attending a private school, it's a good idea to obtain some pre-hire letters before you enroll. This is an excellent outlook to keep in mind! The bottom line is, it doesn't matter what you make week to week, what matters is your W-2's at the end of the year. Some drivers can't see the forest for the trees, so they get a bad attitude, and get testy with dispatch or their DM , and in effect shoot themselves in the foot. If a driver comes into the industry barely scraping by, it can be tough that first year to keep their focus on the big picture. Once they get enough experience to start getting paychecks over a grand a week, it's a lot easier to see the forest, and not cut their nose off to spite their face. It's very similar to someone who starts a new business. Most new companies do not make a profit their first 5 years. So what type mentality does the owner need to have, to make it through those first 5 years? IMO, a driver cannot really size up a company, until they get those W-2's. It's best not to sweat the small stuff, because it can be really detrimental to a drivers attitude, and how they interact with others. I have a 2015 Peterbuilt 579 sitting wsiting for me. I already did the prelimary stuff and I start on the 22nd. My wife and I are very excited. Oh and I will be home every wed night and weekend. It's good to see your hard work has paid off for you. I made the decision to get my happy a.s.s. off the road and live to drive another day. Yep.....Timing and necessity are huge factors in the decision-making process. Here's my situation: I'm 21 and was recently "seperated" from the military with an Honorable Discharge. Thanks for your service! What was your job in the Army? Are you using the GI Bill to pay for CDL school? 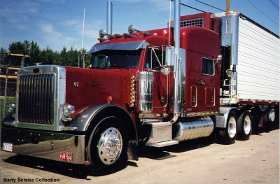 Any idea what kind of freight you want to pull: flatbed, dry van, reefer? Preparing to Leave for CDL Training! It's been a looooong wait & the day is finally here. I know I've come into this conversation late but good luck and enjoy! Looking forward to hearing about your adventures. There ain't nothing like driving through a sunrise. Watching the scenery change though the day is better than watching TV. You will see more of the USA, in all the seasons, from your driver seat than the average person will ever experience.